Venice has great local cuisine, but at the same time it is so full of touristic crapy food that one can easily leave it thinking that those not so fresh street pizzas and humongous colored cookies is all it has to offer. It is so easy to miss Venice's incredible fish market, it's tiny bars serving sparkling prosecco and cicchetti (local style tapas). 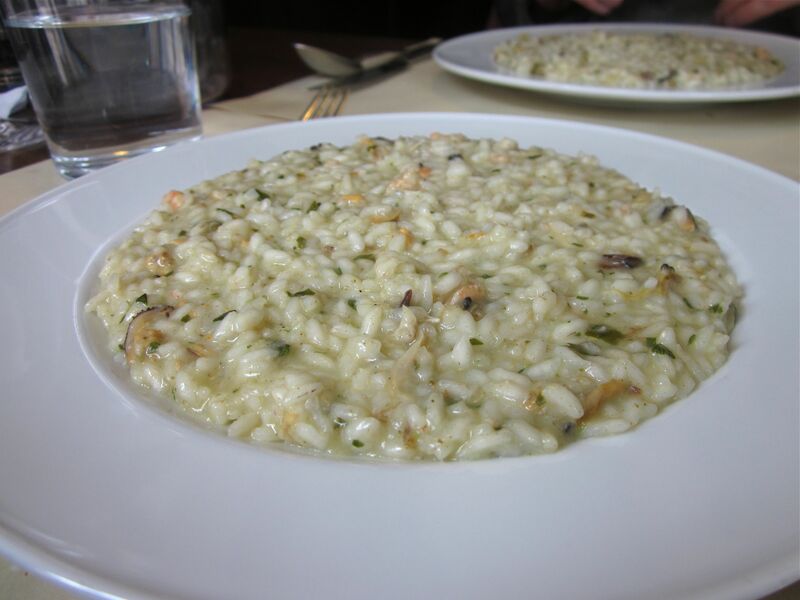 I'm not even mentioning that Venice is home for risotto in Italy and so it is for tiramisu. My first serious insight into Venice's local gastronomy came from Anthony Bourdain's No Reservations. It turned out Venice is nowadays still cooking largely from local fish and locally grown vegetables. It has several markets, but the most impressing one is Rialto. 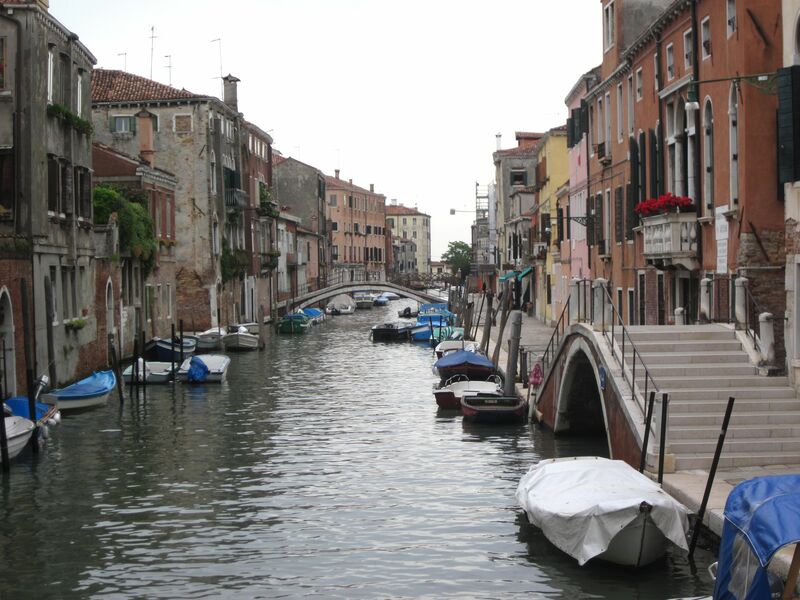 It is just five minutes away from the famous Rialto bridge. From our morning train we went directly to the market to make it while the fish section was open (from 7 am to 2 pm). And indeed it had quite some shiny fresh fish and seafood, especially sardines, Venice is so famous for. Cod, huge octopus, squid with fresh natural ink bag still inside and crabs. I was looking for soft-shell crabs but didn't find them. Not sure whether they are in season or sold on special order only or I just didn't know exactly where to look. Here I really got the idea of renting an apartment in Venice instead of staying at a hotel. I could actually shop at this market and try cooking these beauties myself. 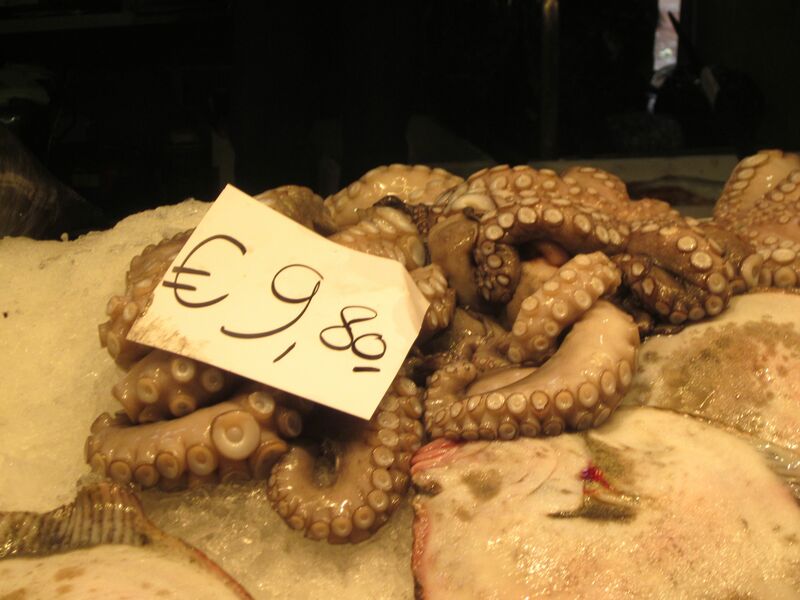 Venice is quite serious about cicchetti - local style tapas, mostly fish and seafood. And it is no less serious about prosecco - local dry white sparkling wine. Chiccetti and a glass of prosecco (ombra) make a dream breakfast. Chicchetti and a spritz (prosecco based cocktail) are wonderful as aperitivo (afternoon snack) before or instead of a dinner. That's exactly what Venice's countless tiny bars are serving. 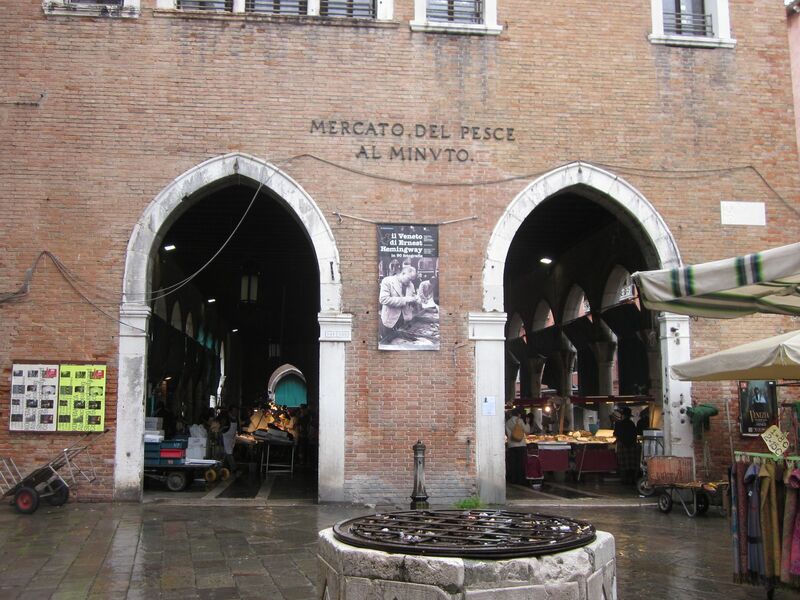 Lots are located around Rialto market and many more can be found in Cannaregio quarter in the northern part of town. 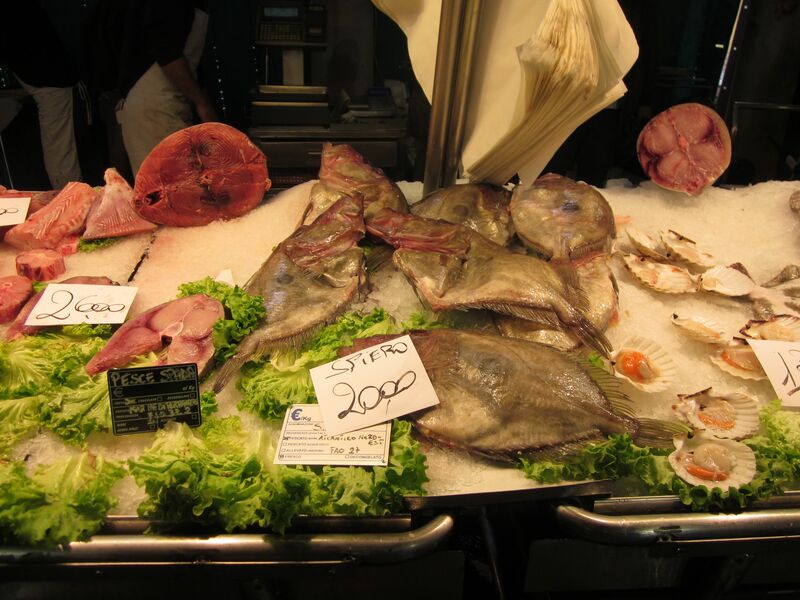 We went to Pronto Pesce, which is just outside the market and is quite famous for it's cicchetti. 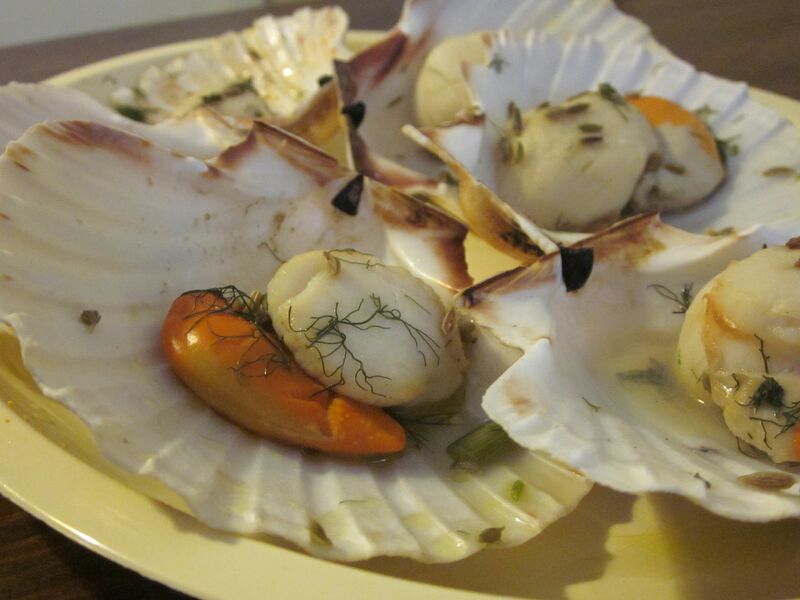 Scallops were cooked naturally in their shells and it looked like with almost no seasoning. I got quite surprised when the host moved to reheating them in a microwave, but I have to say after that they tasted wonderfully. The barman gave us a bottle of prosecco and two glasses: "Just let me know later how many glasses you had". 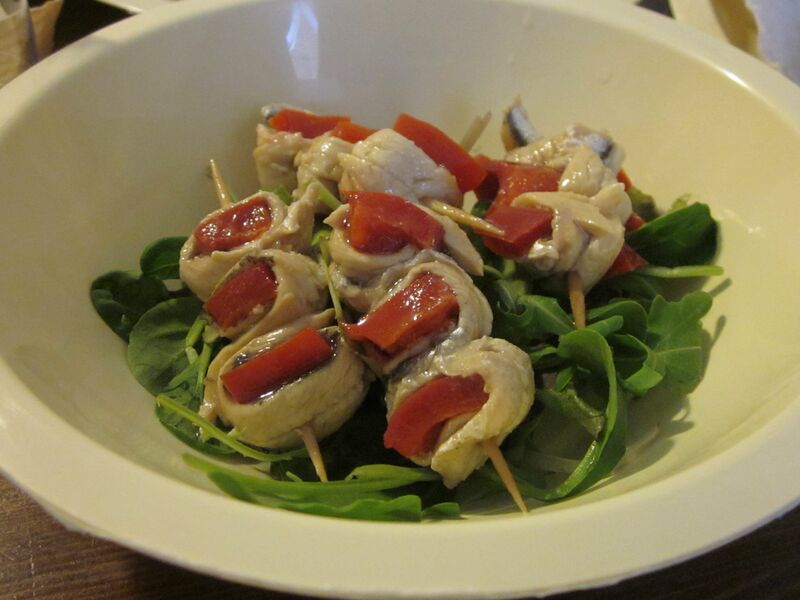 I really liked these marinated fillets (perhaps anchovy) wrapped around sweet and sour marinated peppers. Braised cod with black pepper and olive oil was juicy and full of flavor. Baby octopus was served with celery salsa. That seasoning wasn't really to my taste, but the octopus itself was very fresh and tender. The only thing I didn't like were batter fried zucchini flowers stuffed with mozzarella. 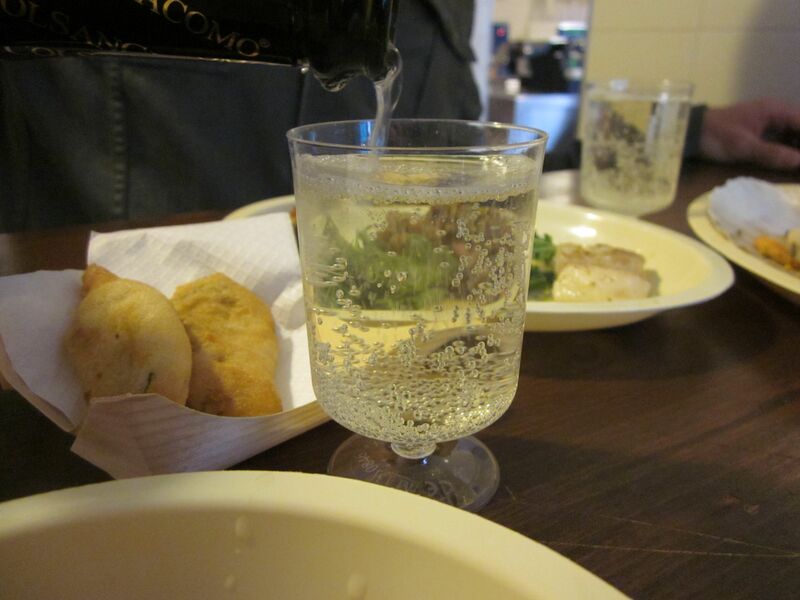 I absolutely loved those in Rome, where they really know how to cook them so that the shell is feather light and crisp. Here the batter was heavy and soggy. I looked for baccala mantecaro (cream of salted cod), another famous Venetian cicchetti, but it wasn't around at Pronto Pesce that morning. 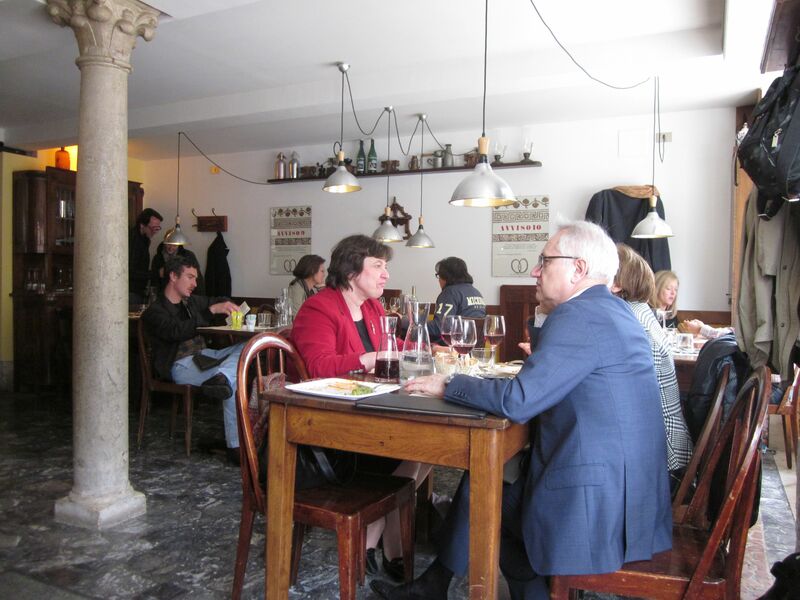 I also heard good things about Do Mori bar and All'Arso and perhaps would try them next time. Our next stop was Cannaregio, a beautiful area much less frequented by tourists. First we went to the wrong vaporetto stop (there are a lot around Rialto bridge...), then we took the right vaporetto, but going the wrong direction. Finally we did arrive to S.Marcuola stop and this itself already felt proud. Cannaregio was pretty and quiet and indeed it felt very natural compared to the largely touristy Rialto quarter. When we actually found l'Anice Stellato place with it's imperceptible door and sign and found they really had our reservation it felt like magic. Luckily, someone I love chose wine - sophisticated white La Raia (2010) - which I really enjoyed. Here I finally tried sarde in saor - also a big thing in Venetian fish starters. The sardines are first deep fried and then sweet and sour marinated with onions. At l'Anice Stellato they also had raisins and pine nuts in the marinade and served the thing with warm grilled polenta. I absolutely loved it. But most of all I looked to taste risotto. I have been having it in restaurants and cooking it myself for many years and I was really curious to see how it actually appears at it's home region. The seafood risotto we ordered tasted strongly and purely of sea and fresh fish. If it had any cheese or butter in, there was just a bit as the flavor was really clear compared to, say, scallop risotto at l'Osteria. Texturally it was more "al dente" then anything I ever tried before. I definitely cook my risotto a couple of minutes and a stock ladle longer. But that one was really good and I well might convert. For the next time, if I plan my visit to Venice at least two months in advance I will make sure to book a table at Alle Testiere (this time I tried a month in advance and it was too late). I would also definitely go to Burano island, just to visit the world famous Trattoria da Romano which makes Go fish risotto. 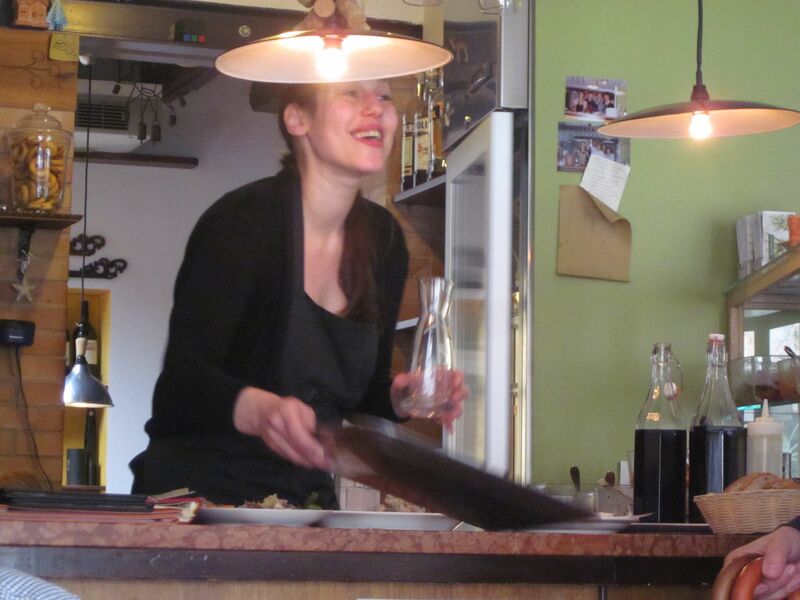 And after that I would perhaps go to Bentigodi and try spaghetti vongole and squid cooked in own ink with white polenta. For the afternoon Venice has quite some options of prosecco based cocktails. 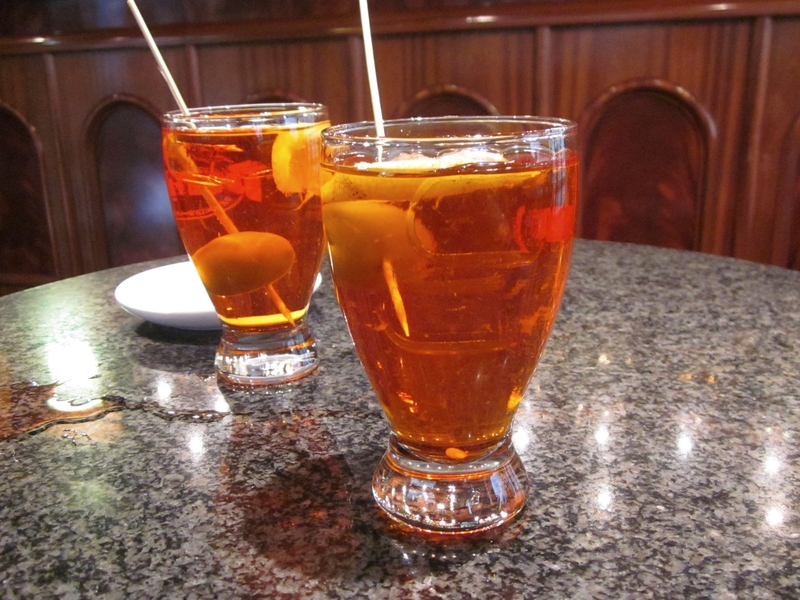 I absolutely loved spritz aperol (prosecco + Aperol), which tastes sweet and orangy and is served with a tangy salty olive. Another option is spritz al bitter (prosecco + campari), which looks red and tastes sharper. And if you are in Venice in the summer, then definitely try bellini (prosecco and fresh peach blend). We did catch a tiramisu on our way to piazza San Marco, but in that random coffee shop tiramisu left much to be desired. Almost no mascarpone or amaretto flavor. I wish I had space for it after lunch, as I'm sure at l'Anice Stellato it would be a complete different story. But one can't get everything in one day. After all, it was already so full of beautiful flavorsome presents. Vaporetto took us back to S.Lucia train station and we left back to Bologna, where the most of our vacation passed and about which I'll make sure to tell shortly.